Mayhaw Jelly is a rare delicacy made from the tart Southwest Georgia. Once Mayhaws were only known as thorny hawthorns that grew in swamps that produced bushels of floating red berries in May that could be easily scooped up with nets out of rivers, creeks and lakes for jelly making. Much of this activity took place near Colquitt, Georgia where tons of this jelly was sought out by gourmets for the traditional breakfast use on hot buttered toast or biscuits. Colquitt, Georgia, is the center of the Mayhaw growing area. Mayhaw trees grow wild in such a small geographical area that the berries are highly prized and the tart sweet jelly hoarded for special occasions Mayhaws are called berries, but technically they are members of the haw or apple family. In May the red berries are gathered by hand or scooped out of the water in fishnets. The berries are boiled, then squeezed, to get clear coral colored juice that is made into “the best jelly in the world” . The Mayhaw Jelly recipe dates from the Civil War era and has been a Traditional Southern treat. You want find a better Mayhaw jelly than this. Next to the tupelo honey this is the next best seller. 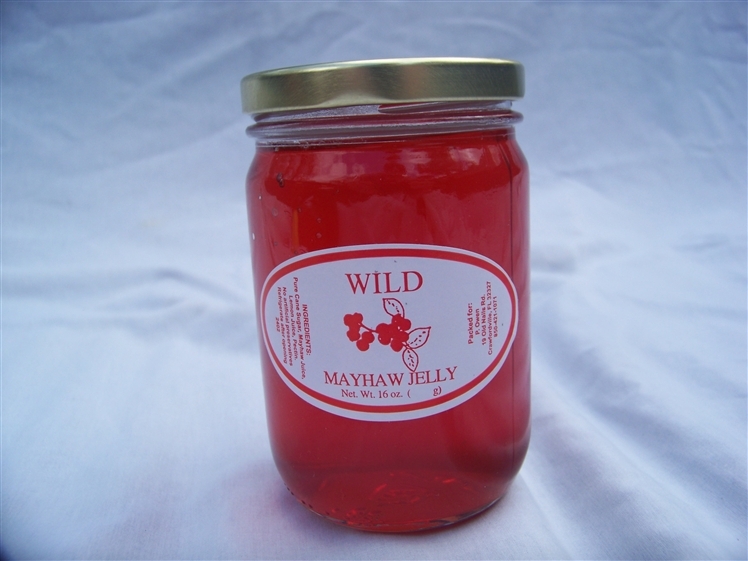 The best Mayhaw jelly from the southern traditional farms.